Welcome back for night two of this dinner challenge. I hope you enjoyed last night’s meal and are looking forward to making tonight’s as well. Tonight I will be sharing a family recipe given to us by an old neighbor. Geraldine lived next door to us when I was just a little girl and she was well into her 70’s. She lived in a very modest way and taught my mother a few tricks of the trade as well. One of those tricks was this recipe. 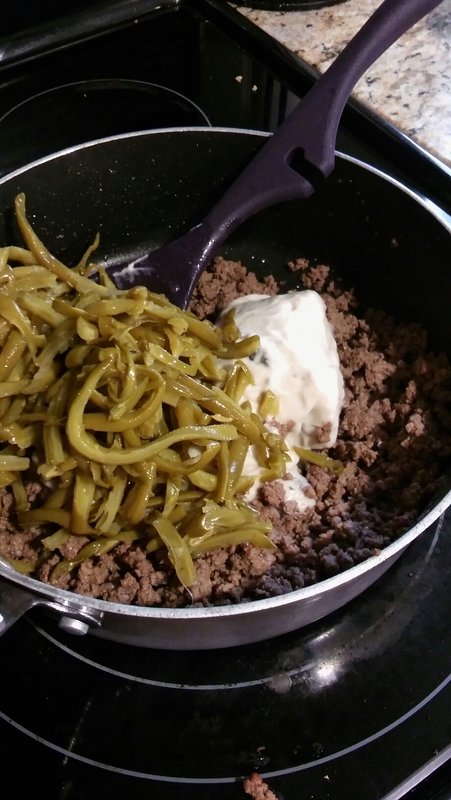 Prepare yourself for a extremely simple but tasty and filling meal. Let’s get started! First, brown two pound of hamburger, with a little salt and pepper, in a frying pan. 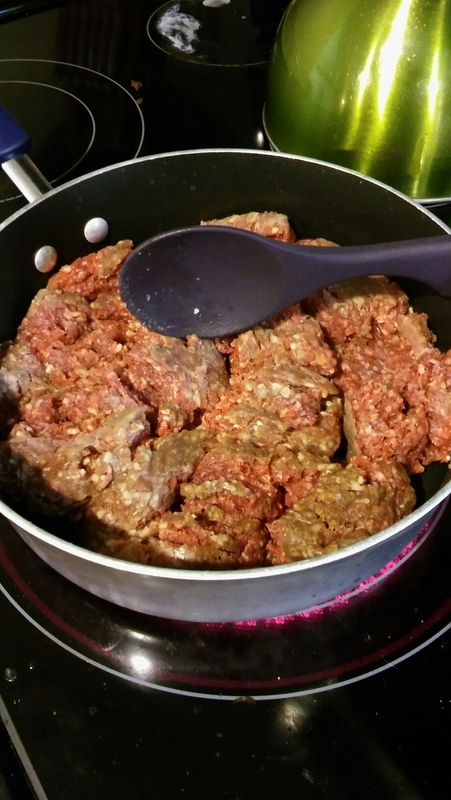 When the meat is about half cooked, start a cup of water in a small pot so that it will begin to boil about the same time as the meat finishes cooking. 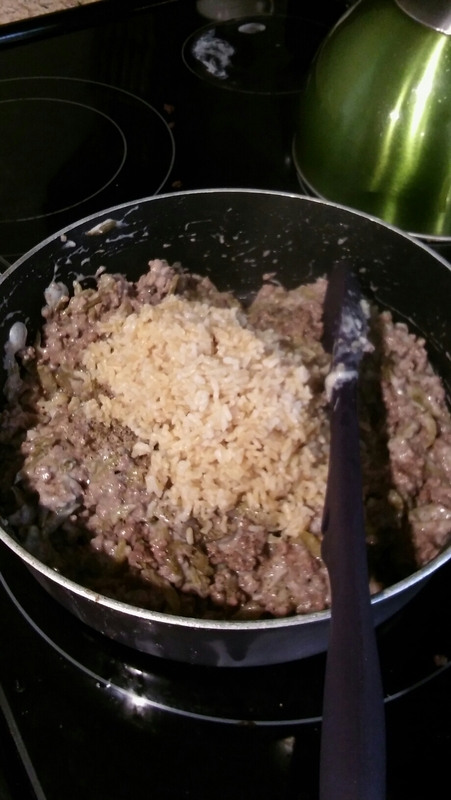 Once the water begins to boil put in a cup of minute rice and follow the basic cooking instructions of the box. Once your meat has finished browning, drain off the excess fat. 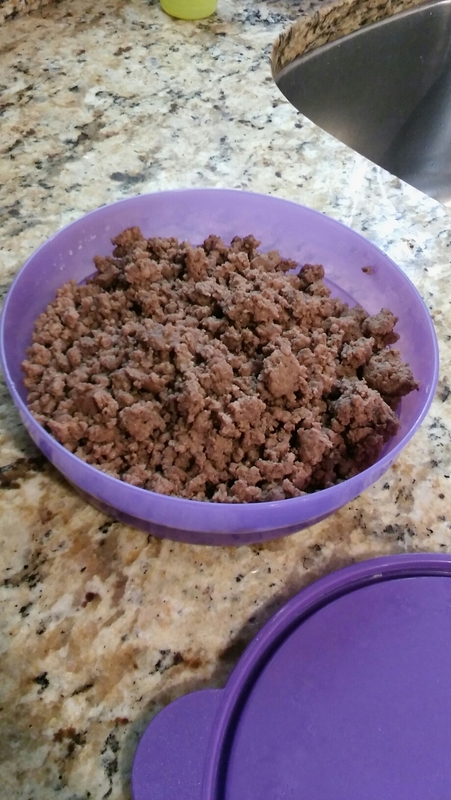 Divide the meat into half, storing half of the meat in a container for later use. Then add one can of cream of mushroom soup and a can of any style cut green beans. Let this warm gently until all of the ingredients are mixed well and warmed through. Finally, once the rice is finished add it to the other ingredients. Continue to heat until all are well blended. Have a small taste and adjust the salt and pepper to taste. Serve and enjoy! I will say it may not look beautiful to some but it tastes so good. This dish also re-heats very well for a lunch the next day. One variation you could try so it would have a crispy top would be to place it in the over at 250 degrees for ten minutes. Or add French onions! Cost for this meal is about $1.75 per person, based on an individual eating about a cup and a half of finished product. Prices may vary based on location of products. In our house we still had leftovers for later this week. Enjoy! I hope you enjoyed tonight’s meal. 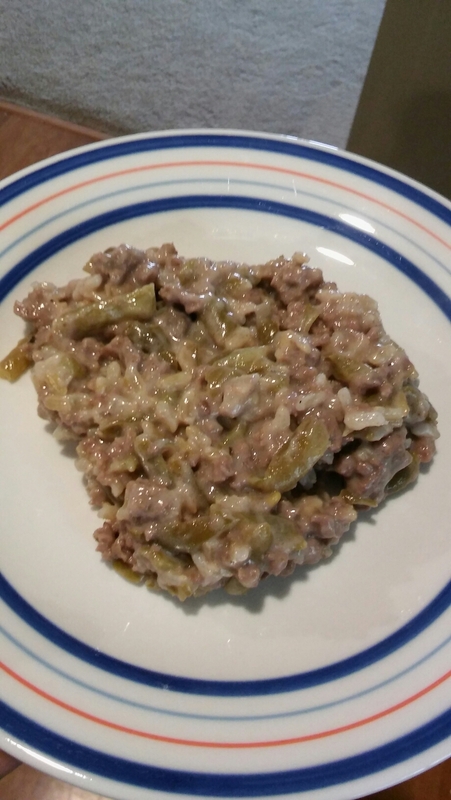 Please feel free to leave a comment of your thoughts on what you thought of the recipe.